← Kindle edition of Microsoft Exchange 2010 Inside Out available now! Being part of the refereeing team that works professional matches sounds interesting to people who are fans of the different sports that support professional teams and it is truly wonderful and privileged to be a part of massive sporting events such as a Heineken Cup final. However, like most things in life there can be a downside. Travelling to games in the European winter (and four of the six Heineken Cup pool weekends are played in the middle of winter) can be problematic and that’s just what happened this past weekend. My assignments this week were in Montpellier and Perpignan for games on Thursday night and Saturday afternoon. 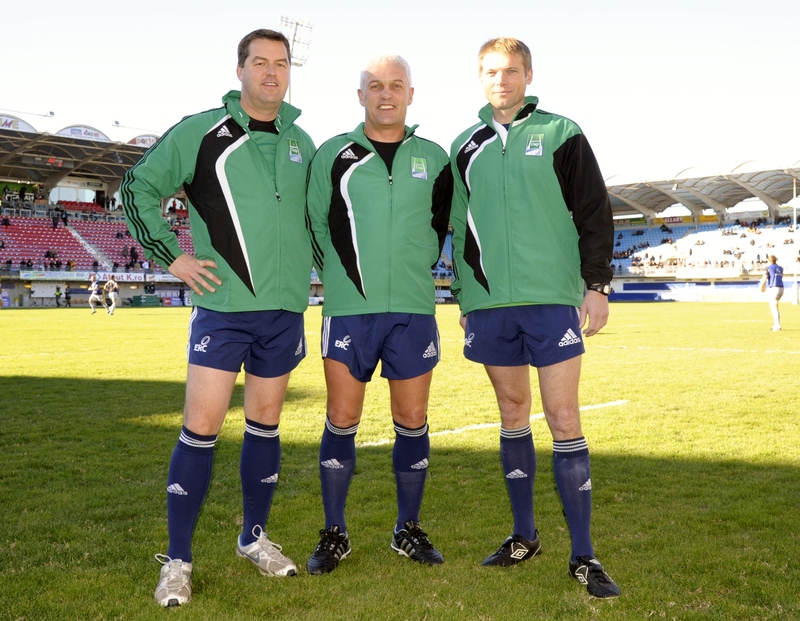 In line with the ERC (European Rugby Cup, the organization that runs both the Heineken and Amlin Cup competitions) directive that refereeing teams (referee, two assistant referees, and a TMO) have to be “in country” the day before a game, the team for the Montpellier game met in Dublin Airport on Wednesday afternoon. The directive is a good one because it makes sure that enough time is available to make alternative arrangements should travel problems occur by either switching referees around to cover games or to get to a game using a different route. We checked in for our Air France flight to CDG (Paris) – luckily, we made use of Thomas Cook offer codes and saved a bunch. The first sign of trouble was when the incoming flight was late so our outgoing flight was delayed. This rapidly turned into a cancellation due to heavy snow falling in Paris. We now had a problem because travel to the rugby centres in the south of France usually involves a transit through CDG unless a direct flight is available to somewhere like Carcassone, Nice, or Toulouse. Unfortunately the airlines cut back their service to airports in the south of France in the winter so the trek through CDG is often mandatory. CDG is a fine airport but… flights from Ireland arrive at a stand that requires a ten minute bus transit to reach the terminal AND connections are often tight. If anything goes wrong such as a delay out of Dublin, the bus not turning up to meet the flight, or a long queue for passport control, you can really struggle to make a connection. Some of my refereeing colleagues pride themselves on their ability to navigate CDG quickly to make impossible connections but thirty years of business travel makes me wary of these feats and I prefer to avoid CDG whenever possible. The situation worsened when Air France cancelled all remaining flights from Dublin to CDG for Wednesday. Our solution was to take the 18:05 Lufthansa flight to Frankfurt to connect to the 22:15 to Nice and then drive from Nice Airport to Montpellier. This seemed viable because both flights went through terminal 1 in Frankfurt and we had a good hour to make the connection. Alas it was not to be. The incoming plane was late and Frankfurt was having its own weather challenges with snow. The result was that we didn’t board until 18:45 and then sat waiting for a take off slot until 19:50. Our chances of making the connection were receding rapidly, even if Lufthansa assured us that all flights were delayed in Frankfurt. Our Airbus 320 arrived over Frankfurt to find that the airport was closed. The plane began to circle as the airport authorities had indicated that it would reopen in about an hour. More snow put a halt to that plan and we diverted to Düsseldorf, landing there at 23:45 to find an almost empty airport. The Lufthansa staff who were on duty couldn’t help with rerouting but they did an efficient job of dealing with 180 people who needed hotel rooms for the night. The ticket desk opened at 5:15am with quite a queue of harassed passengers waiting for help. We were fortunate to talk to a very efficient Lufthansa agent who quickly got us seats on our preferred flight, the 7:20am to Lyon. We then walked down to Hertz and hired a car to allow us to drive to Montpellier. From Lyon it took about 3 hours (including a stop) to drive the 310km to Montpellier, so we reached our hotel by 13:00. The game was to kick off at 20:45 and we had sufficient time to grab some sleep, a meal, and make the normal preparations to referee the game, in which Montpellier beat Bourgoin 39-14. None of the spectators were aware that the refereeing team had had an “interesting” journey to get to the game, which is exactly the kind of performance you want to deliver in a professional game. Friday saw my three colleagues for the Montpellier game return to Ireland while I planned to drive to Perpignan to collect three other colleagues for Saturday’s game between Perpignan and Leicester Tigers. Sod’s Law was in effect again as the team’s flight from Paris Orly to Perpignan was cancelled, probably because Air France was repositioning planes disrupted by the bad weather. In any case, they switched to a flight to Montpellier and I collected them there at 3pm before driving to Perpignan. The game between Perpignan and Leicester Tigers was an epic contest, typical of many of the high-quality and passionate encounters that occur in the Heineken Cup. In this case, the first half finished with a sequence of nine scrums over ten minutes on the Leicester 5m line. A less experienced referee than Alan Lewis (he was refereeing his 69th Heineken match and is the record holder) would have reacted to the noise of the crowd and the pressure exerted by the players and awarded a penalty try after the second penalty. Alan gave a fine demonstration of a referee understanding of how the scrum can be a real physical and mental contest between 16 players. Alan understood the enormous pressure put by Perpignan on the Leicester pack and the steps that they took to resist. At no time did Perpignan get the essential “nudge” on to move the scrum forward in such a way that they could demonstrate that they would have scored but for Leicester collapsing or otherwise illegally stopping Perpignan’s progress. Without this evidence there was no way to award a penalty try, even despite the loud demands of commentators, players, coaches and the crowd. Some might also ask why the two hookers were yellow-carded mid-way through the series of scrums: the answer is simple – they were asked to keep their respective front rows down warned as to the consequence (this was after several penalties and resets). They didn’t comply so the referee had to follow through with the sanction else all hell would have broken loose. Others might query why so many scrums occurred after 40 minutes elapsed and the first half “should have” ended. The answer to this question is clearly found in law where 5.7 (e) states “If time expires and the ball is not dead, or an awarded scrum or line-out has not been completed, the referee allows play to continue until the next time that the ball becomes dead.” In this case, each reset scrum is merely a continuation of the current phase of play and the penalties awarded for scrum offences (or the scrum option taken by the non-offending team) extend the current phase of play and the ball is not dead until the scrum is successfully concluded. As it happened, Perpignan eventually tired of scrummaging and moved the ball to the left to allow the winger to score after collecting his out-half’s precise kick. 47 minutes and 56 seconds were played in the 1st half taking 51 elapsed minutes before it ended 13-9 to Perpignan. The noise and obvious displeasure of the crowd was enormous as the refereeing team left the pitch at half-time; they wanted that penalty try and couldn’t understand that it would have been unfair to Leicester had Alan folded. Truly a lesson in the art of refereeing worth noting for any up-and-coming official. The second half was much better as both teams played rugby instead of messing around at scrums. At the end Perpignan won 24-19 and Leicester were happy to escape with a bonus losing point. We were happy to escape to the airport for a fast transit to Paris (Orly) and stayed overnight in the Novotel Gare de Lyon before flying back to Dublin on Sunday morning. 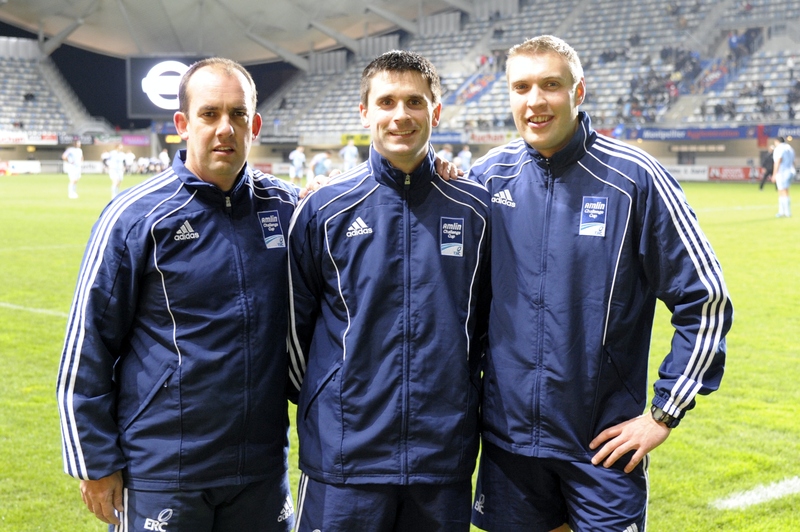 This entry was posted in Rugby, Travel and tagged ERC, Heineken Cup, Lufthansa, Rugby, TMO. Bookmark the permalink. Oh noooo! what a pity! you probably don’t know but I moved to Montpellier in june 2006 🙂 It would have been nice to meet you again after 10 years and funny as it was in France as well, in Sophia Antipolis for the Exchange 2000 academy to be exact. Don’t hesitate to contact me if you will have some time to spend and visit Montpellier!